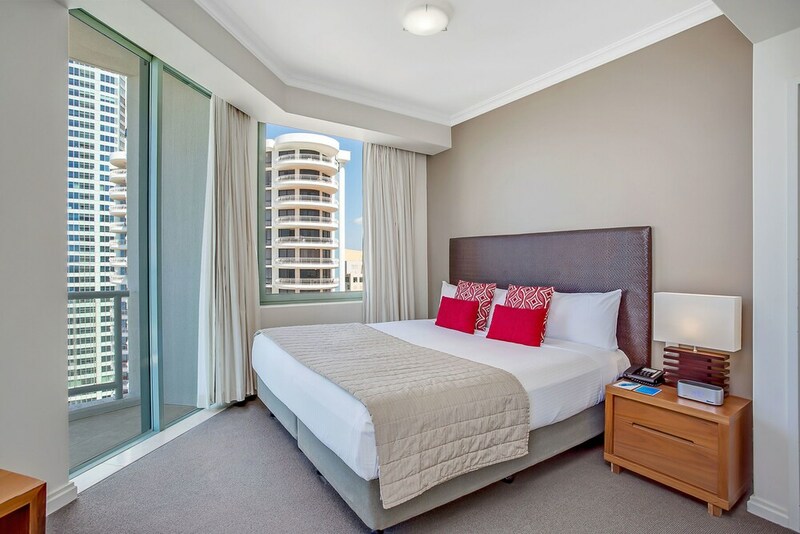 With a stay at Mantra Legends Hotel, you'll be centrally located in Surfers Paradise, steps from SkyPoint Observation Deck and 4 minutes by foot from Surfers Paradise Beach. This 4.5-star hotel is 0.3 mi (0.4 km) from Cavill Avenue and 0.4 mi (0.7 km) from Chevron Renaissance. Make yourself at home in one of the 317 individually furnished guestrooms, featuring refrigerators and minibars. Wireless Internet access (surcharge) keeps you connected, and cable programming is available for your entertainment. Bathrooms have shower/tub combinations and hair dryers. Conveniences include phones, as well as safes and coffee/tea makers. Satisfy your appetite for dinner at the hotel's restaurant, Fables restaurant, or stay in and take advantage of the room service (during limited hours). Quench your thirst with your favorite drink at the bar/lounge. Buffet breakfasts are available daily from 6 AM to 10:00 AM for a fee. Fables restaurant - This restaurant serves breakfast and dinner. A children's menu is available.